‘The Daily Show’ with Trevor Noah is up for three awards at the 70th annual Emmys. The show has been nominated in the best ‘Variety TV Show’ category for the first time since the 34-year-old took over from Jon Stewart in 2015. 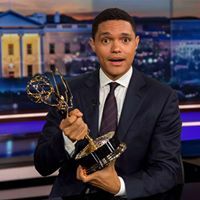 ‘The Daily Show’ also scored nominations in the ‘Outstanding Interactive Program’ and ‘Outstanding Short Form Variety Series’, which earned Trevor his first Emmy in 2017. “Wow, I visited Russia for 3 days and now The Daily Show is nominated for 3 Emmys. Next time I should stay for a week and then run for president,” he wrote on Instagram. Trevor also thanked his team for all their hard work. The Emmys are taking place in Los Angeles on September 17. © 2018 Power FM. All rights reserved.